The third video night at Das KloHäuschen was the showing of a video shot last week on a public holiday when the market was clean, apparently abandoned and quiet. A solitary delivery truck performed for the camera doing a simple and beautiful U-turn. This curve outward towards the camera was projected into the urinal whose interior surface curved away. The first of four video nights was held last night at Das KloHäuschen in Munich. The video Blood on Silk: Site of Production was projected into one of the former urinals in the building. The video shows a series of repeated actions where the inner crease of the elbow is shown to the viewer. This crease is the usual site of blood extraction for sale, for donation or for testing . Another photo from Blood on Silk at Campbelltown Arts Centre. The single work Blood on Silk: Campbelltown uses layers of handmade silk paper both to define the structure of the gallery space and to partially conceal it. Working as a semi permeable membrane some things are allowed to pass and others held. The silk paper is beautiful, isolating and with its references to connective tissues and funeral shrouds, forlorn, invoking the ideas and experiences of absence. Onto this work is projected the second series of work , the three video works Blood on Silk: Trade 2011,2012 and 2013. In a series of three month long residencies over three years at Caravansarai in Istanbul Davies investigated the overlay of trade; the older silk trading routes with the newer routes for bio-products including blood. 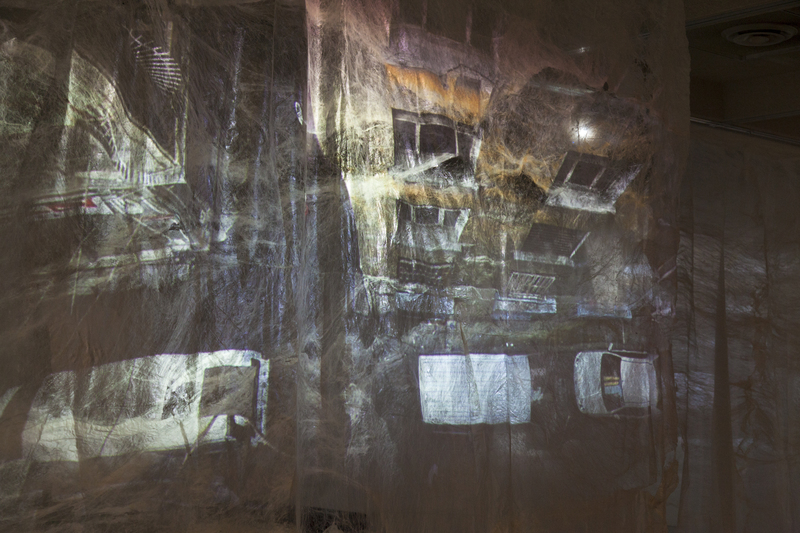 The works she produced during these residencies includes these meditative, almost abstracted video works. Shot from the rooftop terrace of the residency down six floors to the street where hardware shops are opening up in the morning. The choreography of the street is slowly revealed as each prepares to trade.